Why naked? Because there are no fillers, no additives, no sweeteners… just a powerhouse of green super foods that assist with weight loss, increased energy and endurance and that help the body detox from heavy metals. Wheat and Barley Grass provide masses of chlorophyll and nutrients. Spirulina and Chlorella have high amounts of iron and protein and the addition of Moringa provides over 90 nutrients, 46 antioxidants and acts as a powerful anti-inflammatory. Nutritionally matches fresh vegetables, helps to detox the body and provides masses of Chlophyll. Over 90+ Nutrients & Minerals. Full of antioxidants and a fantastic natural anti-inlammatory. A blue-green algae with many health benefits, chief amongst them the ability for heavy metals to be flushed from the system. Another blue-green algae with 60% bio-available protein, high amounts of iron and detox properties. No fillers, no sweeteners or additives of any kind. 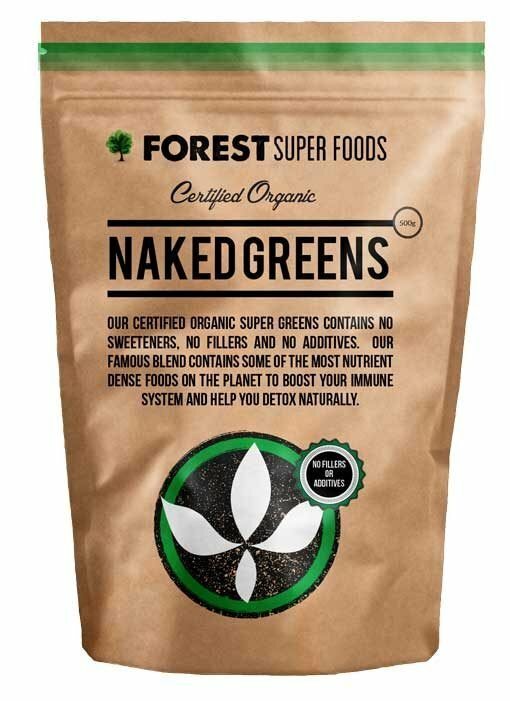 Just straight-up naked super greens! The ultimate green mix containing the most amazing foods on the planet. Simply add 1 – 2 teaspoons to your juice, water or smoothie and relax knowing your body is getting so much of what it needs. I have been using this in my smoothies every morning for some years.. I have tried alternatives but never found anything to beat Super Greens for price or quality. It gives me energy to burn and satisfies my hunger for the day. Another benefit since using this is about 40% of my Grey hair has returned to it original brown colour. I read somewhere that wheat grass can do this. Not sure this will work for everyone but certainly has for me. Highly Recommended. Thanks Forest Super Foods for such an amazing and delicious blend of all the superfoods I need to kickstart my day. The taste is delicious and I don’t have to spend time getting various superfoods to put into my smoothie, just 2 scoops and I’m good to go! An incredibly nutrient rich super food, just one teaspoon equates to a kilogram of fresh vegetables! Helps deliver more oxygen to your cells. Incredible source of B12 and protein. Also contains important nutrients needed to ensure healthy eyesight. Also rich in antioxidants to give your immune system that boost it needs. Nature’s detoxifier; binds to heavy metals in your system and removes them. World’s best food source of chlorophyll which is needed for optimum health. Containing over 90 different nutrients and an incredible natural anti-inflammatory, referred to as “The Tree Of Immortality”. An amazing all-round super food that gives your body plenty of what it loves. Barley Grass contains 5x the iron found in broccoli, 7x the vitamin C found in orange juice and 11 times more calcium than milk. Wheat Grass – Australia, Barley Grass – Australia, Chlorella – China, Moringa – India, Spirulina – China. 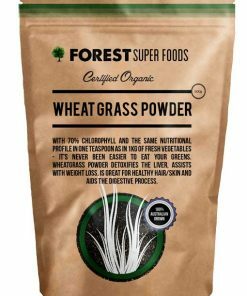 Our Super Greens Mix is mixed right here in the Forest Super Foods Kitchen it contains only Australian Organic Wheatgrass, Organic Spirulina, Australian Organic Barley Grass, Organic Moringa and Organic Chlorella. To find out more information about each of these products are sourced from check the individual product pages. Our Greens Mix is guaranteed to be produced without pesticides or chemicals of any kind and the finished product has no additives, preservatives or fillers. Enjoy this wonderful tasting, nutritionally rich super food mix with confidence. I did a lot of research before I decided to purchase this specific super greens and…I am so happy that I made this decision. The product is top quality and has no added sweeteners as do some other, more expensive products on the market.rnI would highly recommend this product! I’ve let this powder stay in my pantry a while but took it out recently, to support my ketonic diet. And WOW! what a difference it made! I take it in the morning and in the evening I take Chlorella on its own (this is my go to detox for 10+ years). Your products are fantastico! My young teenage son calls it his ‘swamp juice’, he won’t eat any veggies but happily drinks this daily in a glass of juice. Hubby and I also have it daily, great energy booster and keeps you regular! Thank you, great product! In your email you say “you must be full of beans” and I say “I am fuelled by greens” Naked Greens make a great difference. If I could make a recommendation to people I would say stop taking multivitamins which have many synthetic elements and take Naked Greens instead. You will feel the difference. Super Greens Super Speedy Postage. Best Super Greens I’ve had by far. Great Quality product that doesn’t even taste that bad. Value for money and speedy delivery too! Awesome product, super speedy delivery. I have been using this produck for couple of years now, nothing out there compare to this!I just wish they brought back the 500g pack. blending Super Greens in our smoothie. Have tried other super greens though prefer Forest Super Foods. Also love the super fast free delivery and packaging of the product. I’ve tried several greens powders in the past and finally hit the jackpot with this one! 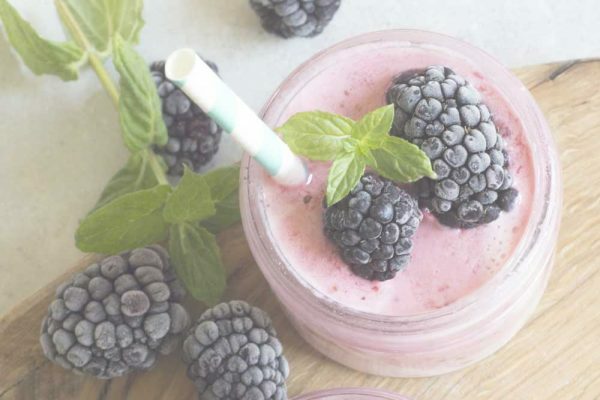 The ingredients list gives me everything I need and makes it easy to drink on it’s own with water or mixed into smoothies (which the kids love too – bonus)! I’m a health & fitness coach and recommend Naked Greens to all my clients. Best tasting greens. After a week I feel so much better and tons of energy. Awesome! I was looking for an unsweetened green powder. This fits the bill and makes my smoothies so beautifully green while making me feel great. Recommended. I have tried so many different “green” powders and love the taste of this one the best. Absolutely love it! Naked Super Greens are great. We are very happy with Naked Super Greens. The taste is great and we feel good using this product. The prompt delivery ensures you are never out of the product. You order and before you know it it arrives at your door. I love this product and really notice when I have run out of it but I never have to worry about waiting too long, their service is so prompt and they are so good to deal with. Very happy indeed, well done Forest Super Foods! This really helps me to improve and maintain good health! Thanks! Great Product & super fast delivery. Best quality, best value, cert organic, super nutrient green powder on the market! Super fast delivery of a great product. No clutter in this product, just top line ingredients and quite palatable too. Highly recommend. Ordered this one afternoon and it arrived the next day in regional Vic. Dissolves well into my morning smoothie, no bitter after taste. Good value. I was pleasantly surprised after trying this product for the first time and have since been enjoying it every day! Before trying Naked Super Greens the only Greens powder I liked was Vital Greens. Your product is just as good as Vital Greens and certainly much better value. Drinking Naked Super Greens makes me feel refreshed and detoxed which I consider a valuable part of my diet. This truly is a quality product. I’ve also started adding your Macca Powder to my post workout shakes and I’m interested in now trying more of your products. 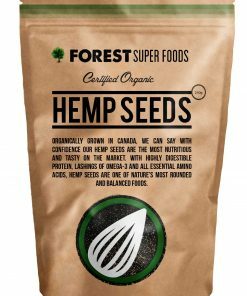 I use this product along with many others from Super Foods as I find their quality to be very good and also being organic. Delivery is fast which is awesome. 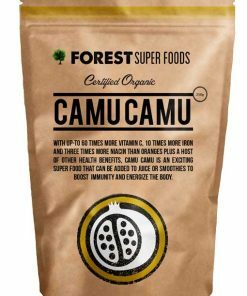 Great product and service from Super Forest Foods. Best Greens on the market!!!!! Has helped increase my sense of wellbeing and energy levels. After trying this for a few days, I can say I have definitely noticed an improvement in my energy levels, thanks. Best tasting super greens I have ever tried. Just mix in with my juice and it’s yummy. Impressed with the fast postage and after sale contact. I love my greens, I have it every night mixed together with my magnesium. Thanks for touching base. Fresh product, confident it is sourced from authentic organic sources. Super fast delivery. Excellent Product, a bit on the expensive side – but quality stuff so worth it. Great Product and super delivery!! A refreshing drink to start and finish the day – the delivery is amazing. Wouldn’t be without it. Menopause relief, more energy, glowing! I have been using this with the Maca powder for a week. Amazing results, quality products and speedy delivery. I ordered the naturally high today for big work days and stress. I think I love you! Absolutely love my Super Greens! Hi. I was very impressed by the quick delivery and easy buying process. As for the Organic Super Greens itself….I love it. It mixes well in water and is extremely palatable. Highly recommended. I don’t mind the taste of the Super Green Powder mix, I simply add it to my organic brown rice and yellow pea protein powder mix and it’s not bad at all. You could add a banana or other fruit, to taste but it’s not really necessary. I also add Maca Powder to the whole mix. Overall, very pleased with my purchase. I love my purchase – it’s the best tasting Supergreen mix that I have tried. Have also been blown away by the service I have received! Great tasting supergreens, and fabulous customer service. Thank you FSF! Im not a vegie fan so i needed something to replace it. Have it in a smoothie every morning and its organic too. Feeling good. Very impressed with the quality, much better than the sweetened commercial brands. Excellent service, happy with product. I stumbled across this website whilst looking for a Super greens product, so glad I did. Excellent product, very happy with it, no GI issues that I have had with other brands. Very informative website and excellent delivery times. My skin has been shinny and smooth since I got this product! I guess because it’s rich in vitamins. I’d like to order this again! Love this product. I have it every morning either in a smoothie or on cereal. It gives me energy as well as not upsetting my stomach. Great for humans and finches alike!! Started using this product for that extra oomph for my finch collection then started a teaspoon a day for myself. Now wouldn’t go a day without it!! Only just started myself but it certainly picks me up!! most nutrient dense no nonsense super-greens I can find! I have been saying super greens mixes from overseas to try and save money. But you need to be careful as some that are out there have confirmed levels of carcinogens. This supergreens formula is 100% certified organic, and I was really surprised that it’s actually cheaper than buying from overseas. The powder dissolves really well- some others on the market are really grainy. Only 4 stars as I haven’t noticed any major improvements, but I will stick with it to see if there is. Superfood, wonderful super food. Try it!! I love the product ❤️ I have it everyday in my smothies and I feel awesome. I have received my super greens, thank you. Wish to emphasise that I am very happy with the products! I add “Super Greens” to my kids breakfast smoothies. With fussy eaters it’s hard to get healthy greens into my kids, so I improvise by adding them into smoothies which they drink happily every day. Love this product! RECIPE: OATS, BLUEBERRIES, STRAWBERRIES, PEAR, BANANA, SPINACH, CARROT, BEETROOT, YOGHURT, MILK, SUPERGREENS AND ACAI. – Just blitz! Excellent customer service too, couldn’t be better! A great produce easy to mix in water or juice. I would highly recommend it. My partner and I buy Super Greens to add to our morning smoothies. We find that Super Greens is a great way to boost our intake of greens everyday. I like the fresh taste that it adds to my smoothie and I feel like my day is off to a great start when I have my Super Greens. Love the Super Greens. The combination is actually pleasant to have in my almond milk shake in the morning. Plus it feels as if I’m energised after consumption. I have been taking two teaspoons in water each day and feel fantastic. I have gained more energy and simply feel so much better within myself. After reading so many positive reviews, I felt it was only fair to do the same. I hope my review can encourage someone else to jump on this fabulous product. ingredients that goes into my Super green mix. Although I’m Very happy with Forrest Super Foods as this is my third order so far. 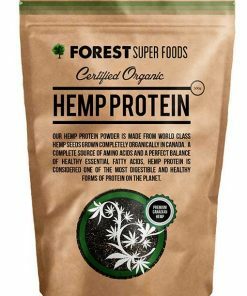 My Delivery arrived very fast and the Communication with Forrest Super Foods is Excellent. Thank-YOU! I love the super green product I purchased, makes me feel extremely energetic and it tastes amazing! I will definitely be purchasing more products from you in the near future! Will encourage others to use. As always the product I feel is of a very high standard. It certainly has a deeper colour and better flavour than other products I have tried. I missed my Super Greens as I was travelling for work and did not wish the hassle of being searched by Customs. With all the extra food and “not so healthy eating”, after coming home, Super Greens is just an absolute wonder and comfort to get my system back on track. I’m Very Happy with the Quality of the Product. Super Fast Delivery and The great taste of Super Greens added to my Smoothie. Highly recommend to anyone. Will buy again. Thank you. Forest Foods Supergreens is a fantastic product I use everyday without fail to feel great.and give my body just what it needs! Great product, fresh, great price and the best delivery I’ve experienced! Highly recommend ! I mix with my smoothie every morning now. Perfect! I am a new customer. I live in regional Victoria, made the order on Monday night, received the product on Wednesday afternoon! I have been looking for superfood for a while and I just had a teaspoon of this green superfood mix with almond milk and I love it. It gave me energy immediately after the drink. been having small teaspoons in my shakes, trying a couple big teaspoons now with some Peanut butter, Carrot, Spinach leafs and Orange, so fresh and nice! I blend 2 overflowing teaspoons daily with water and a handful of frozen organic berries . Within days I noticed more energy and a general feeling of well being. I am pleased to have the natural taste rather than purchase a product full of dubious additives to make the taste more appealing. 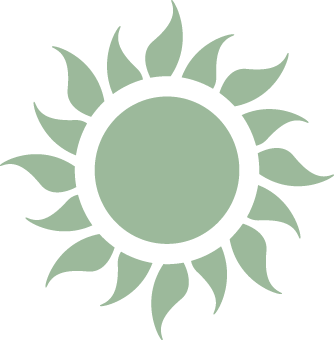 The service is excellent also so a 5 star rating is well deserved. This was my second purchase and I love that it now contains kale and moringa – making something that was already amazing even better! And once again, overnight delivery to Perth is unheard of – love the great product and great service! Great turnaround on order placement and delivery. Very efficient operation. I’ve tried a few different green powders, with main interest in Clorella. Your mix is so easy to take and I actually like the taste of it! Great addition to smoothies but I usually just have it in water. I have done so much research into ‘cracked wall vs non cracked wall’ Clorella and am still very unsure about it. I read your suggested article but am a bit disappointed that you offer information, written in the 50’s!! which is a fair while ago. I’ll keep searching! No more sickly sweet taste! I was so pleasantly surprised at how palatable this was. The main reason I no longer use this product from other brands. is due to it having such a terribly, sickly sweet taste. A lot of the brands I have tried do sweeten there product with Stevia , which is great, but they always make me feel so sickly as they tend to be far too sweet for me. I am thrilled and intend to start my family on it. Honestly such a wonderful taste, so natural, well done! I am so glad I gave this a try as I had given up on my super greens and not used them for a long time now. I feel wonderful, thanks a ton. Bought maca and super greens. Super fast shipping. Both products are great tasting, and appears to be better quality than other brands i’ve been using for quite some time. Feels great. Should’ve got these sooner! Great kickstart to the morning. Easy to drink with water, will be purchasing again. I will be getting all of my products from you!!!! I have purchased super greens from health food stores and have found that they are NOT what they claim to be. 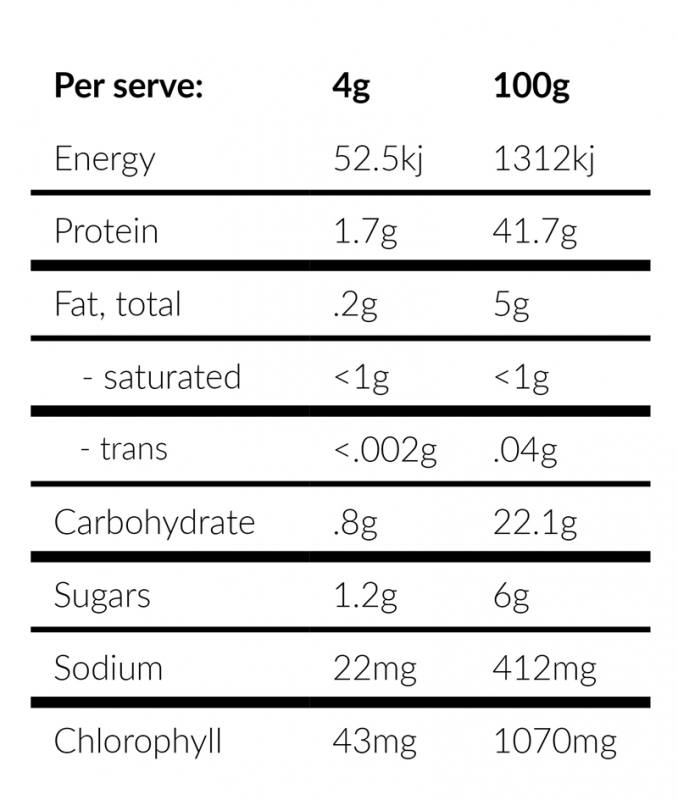 They are made from imported products and the percentage of Spirulina, Chorella, wheat grass and barley are considerably minimal to what the desired amounts should be. Plus they are from chemically driven farms that produce product that has been tainted by pesticides. Forest Super Greens are exactly what they advertise! I noticed the difference immediately! The consistency of greens, the density and obvious clean flavour and quality is leaps and bounds above the rest! 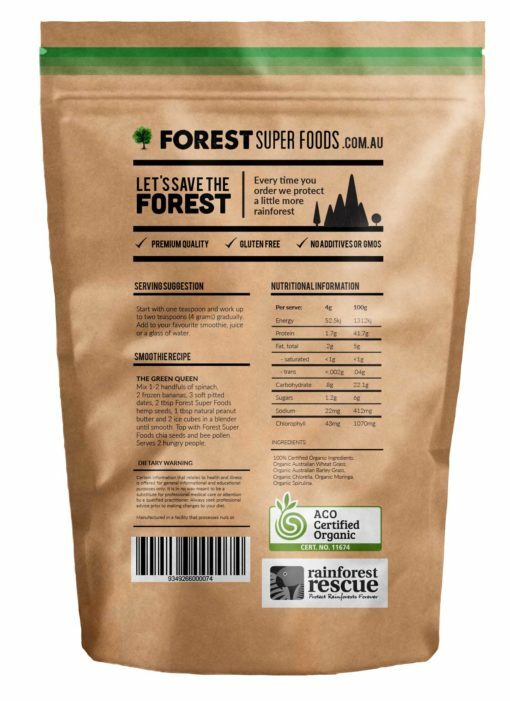 Well done Forest Super Foods! Finally I have found the quality Super Greens product I have been searching for. Great product to be added into any breakfast mix. Highly recommend and all certified organic ingredients which is a bonus! Have ordered Super Greens Mix twice now. Have found this product to be beneficial to overall wellness. Provides a nice boost of green supplements to the daily diet combined with healthy diet. An excellent product! I take it each morning with coconut water and feel great! I need to share this fact with as many people as possible. I have been plagued all my life by dry skin. Then one day I saw myself in the mirror and I was quite frankly stunned. My skin was shining. It looked so healthy. There’s not one single dry flake on of skin on my body. It was an amazing event. There’s only one reason for this change. The Super Greens Mix. Quick delivery and very happy. I hate most vegetables so I make a smoothie every morning with fruit and juice and add super greens to it also. Gives me plenty of energy for the day. Hello everyone. Well I was surprised at how quickly this item was delivered to my doorstep. But even better than that is how this food (when mixed with some juice) seems to leave me satisfied for most of the day. I just don’t get as hungry. I can work harder and stay focused. Thank you Forest Super Foods! I use my super greens mix in summer by adding it to fruit smoothies (filled with yoghurt, mango, banana, soaked goji berries, and chia seeds!) In the winter, I like to simply drink my super greens mix with hot water and some apple cider vinegar – great for keeping away those colds! Highly recommend this product! I love this powder!!! My body now feels even better with this added into my blended creations of fresh fruits every day. 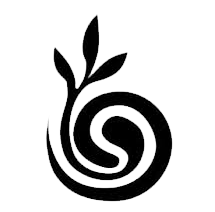 I am so happy there is an Australian website that can provide well priced, fantastic organic products. Fast shipping, free samples, quality products.. Looking forward to be a loyal customer for years to come! Thanks!! I had read that whilst this stuff is good for you it can be a bit like drinking “swamp water” ..I have persisted with the powder and now don’t find it bad at all. I mix my green powder with pulpy orange juice, letting it sit for a bit so it dissolves, and it isn’t unpleasant at all (I have started mixing mine with Moringa powder now also). I have a smoothly for breakfast each day and each day I used to battle to find fresh greens to add to my mix. Then there is the hassle of washing them so that they are free of any chemicals used by the growers. All of this time consuming process was quickly replaced by simply adding one tablespoon of Forrest. Foods Organic Super Greens Mix. Not only is it now easier & quicker to make my daily smoothly but I also have the assurance that I’m getting the best of what my body needs. Hassle free! Thanks Super Foods. 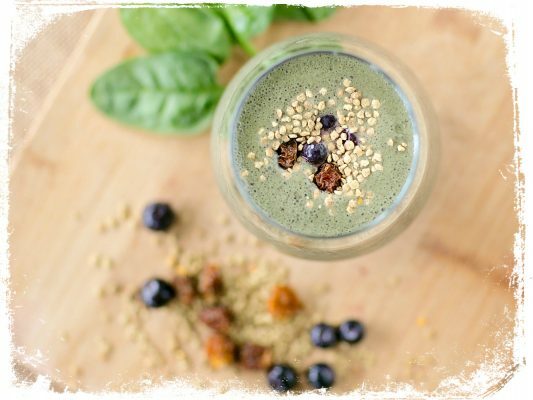 Just be aware that it has a definite ‘seaweed-y’ smell (fine for me as I love things like nori) which may not be for everyone, but I love adding a spoon of this to my morning green smoothie, you’ll hardly notice it, but you’ll feel the difference! Great Green Powder…Smell good and a lovely addition to my morning smoothie! I bought this as a supplement to a high protein low carb diet as I thought it would help me obtain the greens I needed without having to munch a wheelbarrow of grass every day. I initially tried 2 teaspoons added to a glass of water. This was a mistake as it was difficult to mix. I now mix 1 teaspoon to a paste with water and gradually add further water. I’ll admit that I skull it and then wince at the aftertaste however the thought of all that extra healthiness keeps me going. When I am at the weight I want to be I think that I’ll add it to a simple vege/fruit juice. Definitely notice an improvement in overall health. Feel very clean and unglugged. Definitely recommend. Love love love this product, love packaging and texture and it is amazing in a Green Smoothie. Have mine every morning and it lasts forever which is great!! Gives you so much energy you will notice such a difference after just a week. I used to feel funny in my stomach after having my regular fruit and veg juice. Since I added Super Green Mix in my juice, the problem was gone. I also have more energy each day. I really like the product. After my terminally ill husband has been using this and other immune and anti-inflammatory products his metatisis seem to have slowed. Excellent product full of antioxidants, calcium, a ton of iron and more protein than meat.. awesome for vegetarians! Pretty good for meat eaters too I guess, but for me, it’s perfect. 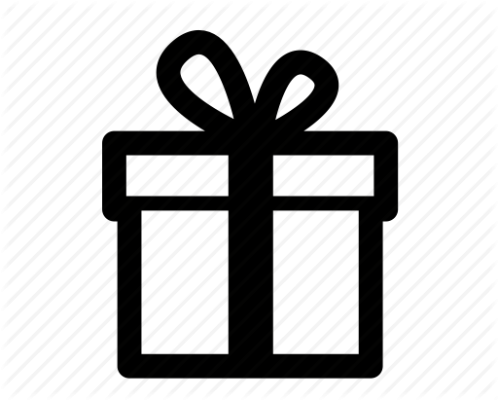 Very fast and prompt delivery as well. Thanks. ps. and they plant a tree as well! Great for me and the planet too.. I have lots of food allergies & have to rely on additives to keep healthy. This product is ideal for me, mixed in an almond milk shake & lots of additives, this product gives a unique, tasty flavour but keeps me healthy! Has all the green goodies I need! Very highly recommended …. 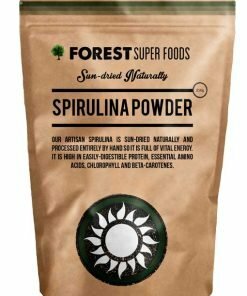 I purchase Forest super greens mix as it has all the mix I used to buy separately, spirulina, chlorella,organic wheat greens & organic barley greens. I know the product gives me all I need in a super greens mix, to detox my body daily & to provide me with all the greens in abundance I need for the optimal health. It’s a great product, thanks ! This not only provides me the energy for the entire day, it also provides me an overall sense of good health. It’s not always easy to eat as healthy as I would like, but taking this daily ensures that I get the full nutrients and antioxidants needed. I’m really happy with the service, price and product. It was promptly delivered and exactly what I was expecting. Thank you, I will order through you again. I appreciate your prompt delivery, am yet to use it. Finally found them reasonably priced with fast delivery. Thanks for the free sample. Great customer service wins me over every time! If you want to feel complete wellness then this is the product for you. It has sorted out my daughter’s acid stomach and my irritablel bowel. Although not tasty, it is fine mixed with juice and taken quickly. The health benefits far outweigh the pond weedy taste. I have recommended to all family and friends.